States look to delay mandatory water restrictions and preserve hydropower generation. 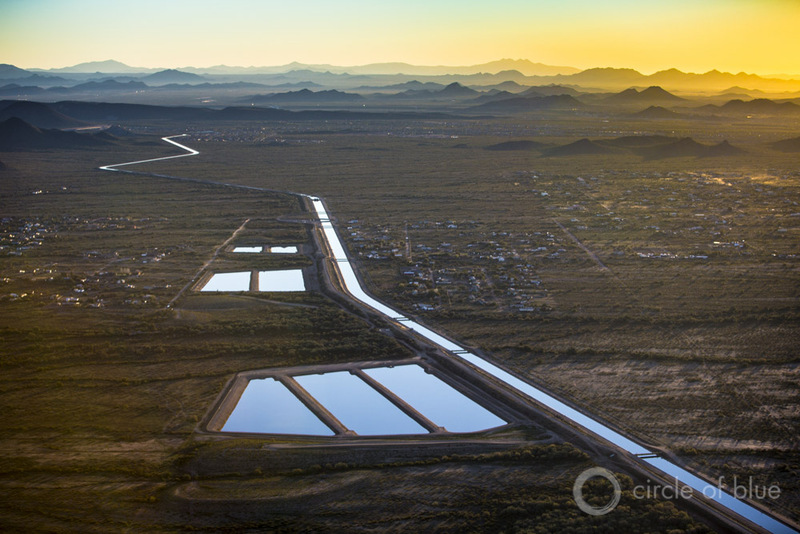 The Central Arizona Project canal passes groundwater recharge ponds to the north of Scottsdale. The 540-kilometer (336-mile) canal delivers Colorado River water to the interior of Arizona. Click image to enlarge. With water levels in Lake Mead — the nation’s largest reservoir and a bellwether for water supplies in the Southwest — setting a new record low every day, the seven states of the Colorado River Basin are finalizing a pair of novel water-conservation agreements that will keep more water in the shrinking lake. The agreements are, in effect, life support measures for a river system where water use exceeds supply. By taking less water out of Lake Mead and its sister reservoir, Lake Powell, located upstream, the states hope to delay the day in which the Basin’s first-ever shortage is declared and to slow the decline of hydropower generation, which is cheaper than alternative sources. A shortage occurs if Mead’s elevation is projected in August to be below 327.7 meters (1,075 feet) in the following January. Current projections show Mead’s elevation at 328.3 meters (1,077 feet) at the start of 2016. Signed last year, the agreements involve local, state, and federal agencies. The Pilot System Conservation Agreement is an $US 11 million collaboration between big urban water suppliers — Central Arizona Project, Denver Water, Metropolitan Water District of Southern California, and Southern Nevada Water Authority — and the Bureau of Reclamation, the federal agency that manages the Basin’s largest dams. The group initially had hoped to select the conservation projects that would receive funds by the end of the month, but that timetable now appears unrealistic, according to Rose Davis, spokeswoman for the Bureau of Reclamation’s Lower Colorado Office. “It’s not going as quickly as we had hoped,” Davis told Circle of Blue, citing as the chief problem “communication delays” between those submitting the proposals and the group evaluating them. Some of the organizations that submitted proposals, for instance, have boards that meet every few months, Davis explained, which slowed the process. A decision on how to allocate the funds should come by the end of the summer, Davis said. The other agreement is a memorandum of understanding (MOU), signed last December, between the three Lower Basin states: Arizona, California, and Nevada. The three states will reduce water withdrawals from Lake Mead by 913 million cubic meters (740,000 acre-feet) by 2017. The conserved water equals 3 meters (10 feet) in the lake’s surface elevation. Every foot is important as the reservoir approaches the level at which a shortage is declared and mandatory water restrictions occur for Arizona and Nevada. Because it takes the deepest cut in a shortage, the Central Arizona Project (CAP) — the agency that delivers Colorado River water to Phoenix, Tucson, and numerous irrigation districts and Indian tribes in the state’s midsection — is the most active player so far. CAP reduced its diversion from Lake Mead by 31 million cubic meters (25,000 acre-feet) in 2014. According to Chuck Cullom, Colorado River manager for CAP, the agency is trying to achieve roughly half of its 425-million-cubic-meter (345,000-acre-foot) MOU commitment this year to delay a shortage. CAP signed contracts with nine Arizona irrigation districts to reduce water use under the MOU. CAP will pay the districts $US 5 million to reduce water use by 99 million cubic meters (80,000 acre-feet) per year over the next two years. After soliciting a first round of proposals for the Pilot Conservation Project last October, the Bureau of Reclamation is now evaluating the most promising submissions. Irrigation districts, cities, and tribes put forward 20 ideas. Davis said that Reclamation and the group of urban water agencies are “very interested” in five to seven proposals. Paying farmers not to grow crops — thus saving water — is one strategy being employed in Arizona to reduce demands on the Colorado River. 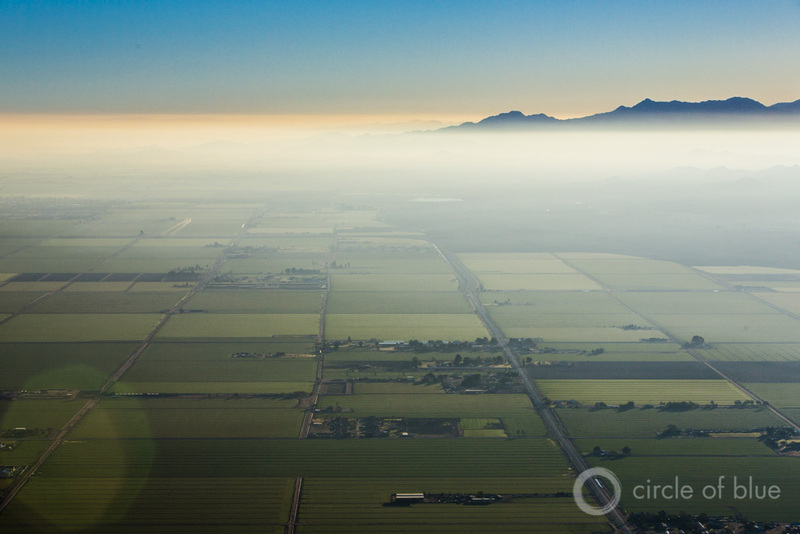 These fields are to the west of Scottsdale and Phoenix. Click image to enlarge. “We’re looking at which proposals we can get reasonable amounts of water from,” Davis said. Of the $US 11 million, some $US 8.25 million will be spent on projects in the Lower Basin, while $US 2.75 million is for the Upper Basin, which includes Colorado, New Mexico, Utah, and Wyoming. Reclamation is not releasing more information about the types of projects being evaluated because the organizations are competing for the same funds, seeing who can save the most water at the lowest price. Unlike most conservation projects, in which conserved water is earmarked for a particular agency, the water saved by this program will belong to no one. Called “system water,” its sole purpose is to boost reservoir levels. A second category of conserved water is called “intentionally created surplus” (ICS). This is water stored in Lake Mead that is claimed and can be withdrawn at a later time, if reservoir levels recover. At the end of 2014, according to Reclamation, Mead held nearly 1.5 billion cubic meters (1.2 million acre-feet) of ICS, which accounted for more than 10 percent of the water in the reservoir. When CAP’s Cullom described the potential conservation projects in more detail, he said that some of the pilot projects being considered are farmland fallowing, municipal conservation, and forbearance agreements, which are agreements not to use all of the water that a user is entitled to. Arizona’s first farmland fallowing program began in 2014. Cullom views the program as an encouraging development for a basin confronting the limits of its water supply.